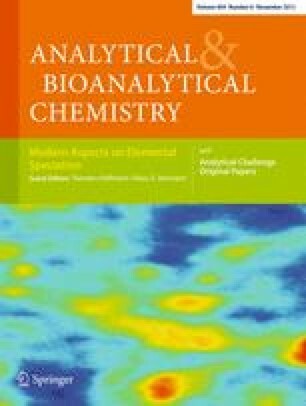 The tobacco-specific nitrosamine metabolite 4-(methylnitrosamino)-1-(3-pyridyl)-1-butanol (NNAL) is a valuable biomarker for human exposure to the carcinogenic nitrosamine 4-(methylnitrosamino)-1-(3-pyridyl)-1-butanone (NNK) in tobacco and tobacco smoke. In this work, an efficient and sensitive method for the analysis of NNAL in human hair was developed and validated. The hair sample was extracted by NaOH solution digestion, purified by C18 solid-phase extraction (SPE) and molecularly imprinted solid-phase extraction, further enriched by reverse-phase ultrasound-assisted dispersive liquid–liquid microextraction (USA-DLLME) into 1.0 % aqueous formic acid, and finally analyzed by liquid chromatography–electrospray ionization tandem mass spectrometry. Good linearity was obtained in the range of 0.24–10.0 pg/mg hair with a correlation coefficient of 0.9982, when 150 mg hair was analyzed. The limit of detection and lower limit of quantification were 0.08 and 0.24 pg/mg hair, respectively. Accuracies determined from hair samples spiked with three different levels of NNAL ranged between 87.3 and 107.7 %. Intra- and inter-day relative standard deviations varied from 4.1 to 8.5 % and from 6.9 to 11.3 %, respectively. Under the optimized conditions, an enrichment factor of 20 was obtained. Finally, the developed method was applied for the analysis of NNAL in smokers' hair. The proposed sample preparation procedure combining selectivity of two-step SPE and enrichment of DLLME significantly improves the purification and enrichment of the analyte and should be useful to analyze NNAL in hair samples for cancer risk evaluation and cancer prevention in relation to exposure to the tobacco-specific carcinogen NNK. An efficient analytical method based on LC-MS/MS detection has been developed and applied for analyzing the tobacco-specific carcinogen NNK metabolite NNAL in smokers’ hair. The authors gratefully acknowledge the financial support from the Key Laboratory of Cigarette Smoke Research of China National Tobacco Corporation (SZBCW201100780) and the fundamental research funds for the central universities (WK2061020001).